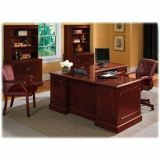 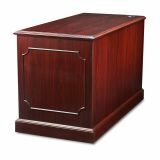 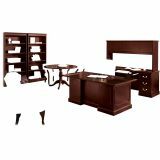 HON 94000 Series "L" Workstation Right Return, 48w x 24d x 29-1/2h, Mahogany - 94000 Series laminate desks from HON combines 18th Century design with 21st Century performance. 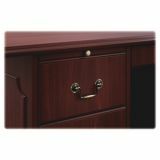 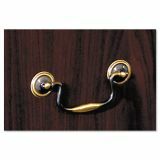 Classic details like decorative moldings, antique-finished brass handles, and distinctive plinth bases make the 94000 Series a popular choice in legal, financial, and government sectors. 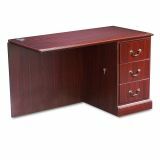 A range of components make a variety of configurations possible, including conventional desk-credenza offices, L- and U-shaped workstations, and reception stations. 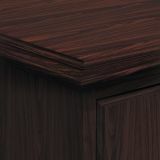 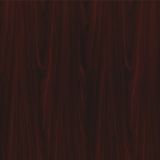 Top-grade scratch-, stain- and spill-resistant laminate worksurfaces mean modern-day durability and easy maintenance. And like all laminate desks from The HON Company, the 94000 Series features rugged inner-frame construction, assuring trouble-free performance for the maximum return on investment.